Ever since last month when Dawn over at First Look, Then Cook posted her recipe for baklava, it’s been on my mind. I instantly thought of an ice wine we have that would match this dessert perfectly. Not to mention I’ve never worked with phyllo before and it sounded like a challenge I needed to tackle. So when we were looking for Egyptian desserts and came across the recipe for Baklawa, the Egyptian version of the dessert, I knew it was time to get to work. 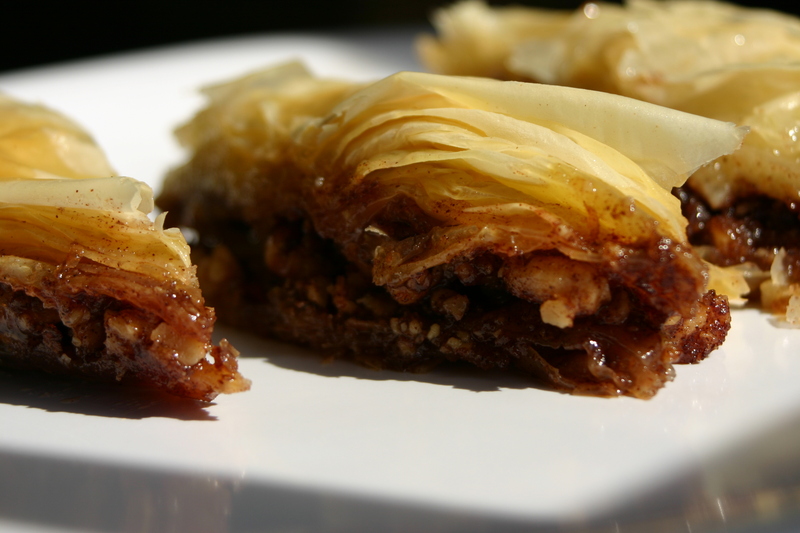 The main differences between Greek baklava and Egyptian baklawa are that the Greek version uses honey in the syrup and almonds in the pastry. 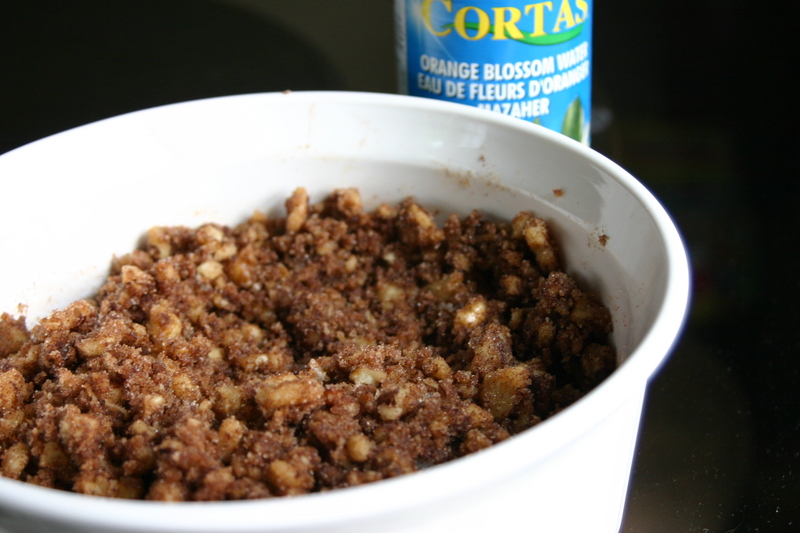 The Egyptian form of the dessert uses sugar and orange blossom in the syrup and omits the almonds. Either way, the dessert sounds intriguing to me and dad, and one that we thought even Mr. N and Miss A would enjoy. Miss A helped me out early in the process. 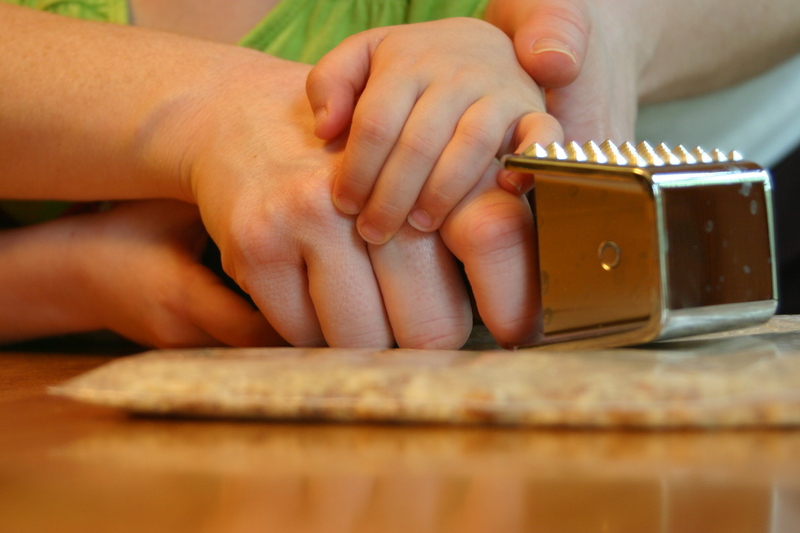 She was very excited to see the mallet coming out again and was eager to crush the walnuts. Next we melted the ghee, which as we learned is clarified butter oil. We were planning to just use butter, which would work as well, but we were surprised and excited when we saw ghee at the store so figured we’d go authentic. It was then time to work with the phyllo. I emptied the kitchen for this part of the process. I’ve never worked with phyllo and I read all sorts of warnings about how delicate it is and how quickly it dries out. So I knew that I needed to have every ounce of my patience available. 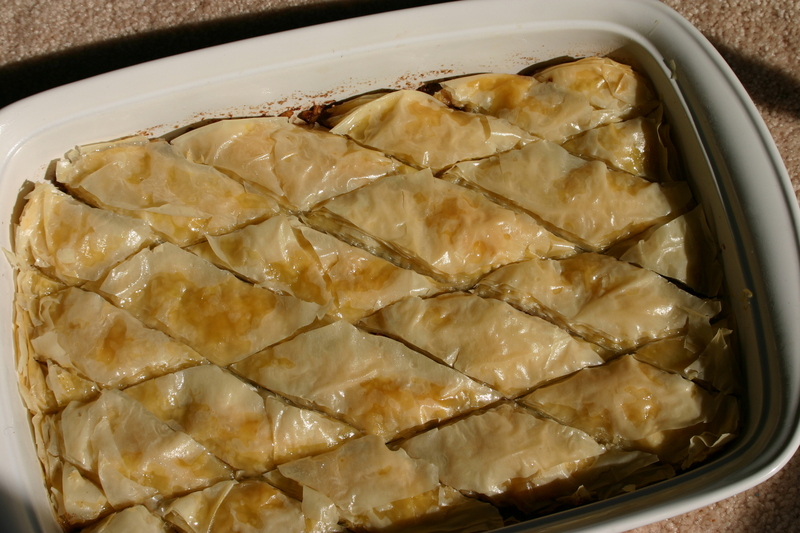 I began by folding one sheet of the phyllo in half and placing it in a greased 9″x13″ baking dish. 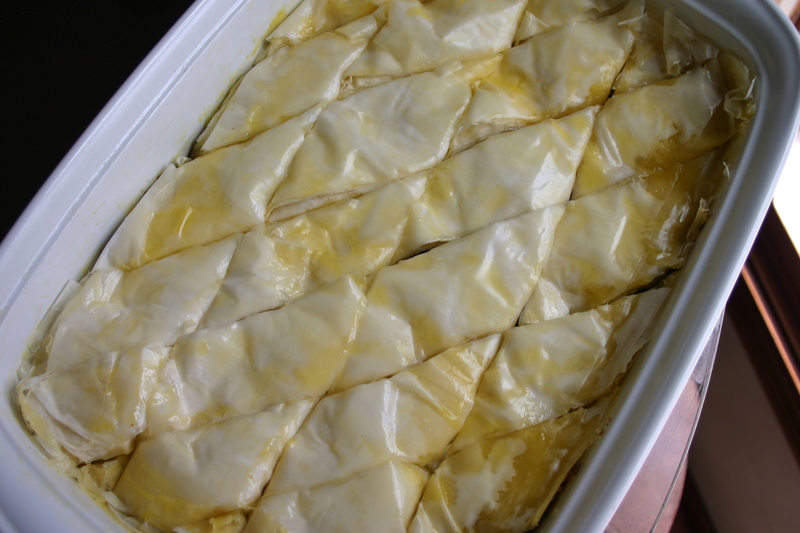 I then brushed it with melted ghee and repeated this process until half of the phyllo sheets were used. This was a tricky process. The phyllo truly is very thin and delicate (think single ply bathroom tissue), and you have to make sure to keep a damp towel on the unused sheets so they don’t dry out. Once I was halfway through the phyllo, I covered the it with the nut mixture and spread it out evenly. Make sure to sample a little – it’s yummy! It was then time to finish up with the phyllo. 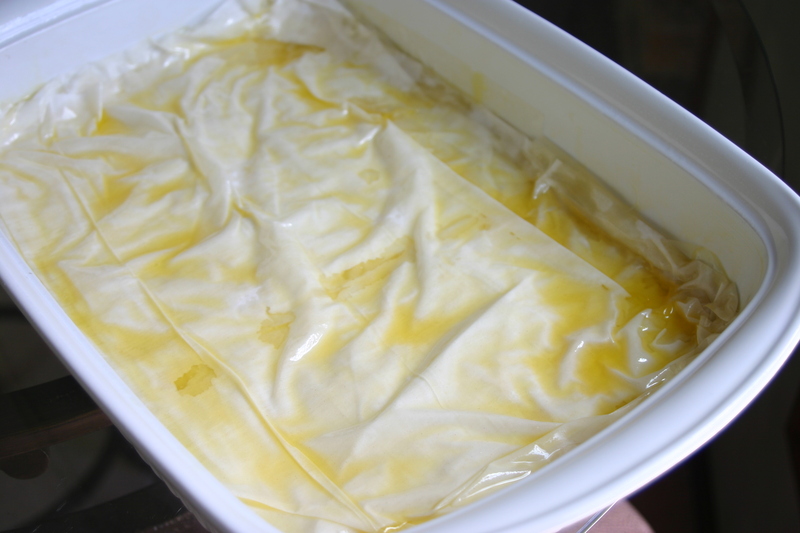 Again, I folded the sheets in half and brushed with the melted ghee until I used all the phyllo sheets. Finally I took a sharp knife and made diagonal slices from the left corner to the right and then flipped the dish to slice rows – making little diamond pieces. The baklawa was then put in the oven at 400F for 5 minutes at which point the heat was turned down to 300F. The baklawa bakes for about 50 minutes, or until the pastry is golden brown. But wait, there’s more. As soon as the baklawa goes in the oven it’s time to begin the sharbat (syrup). 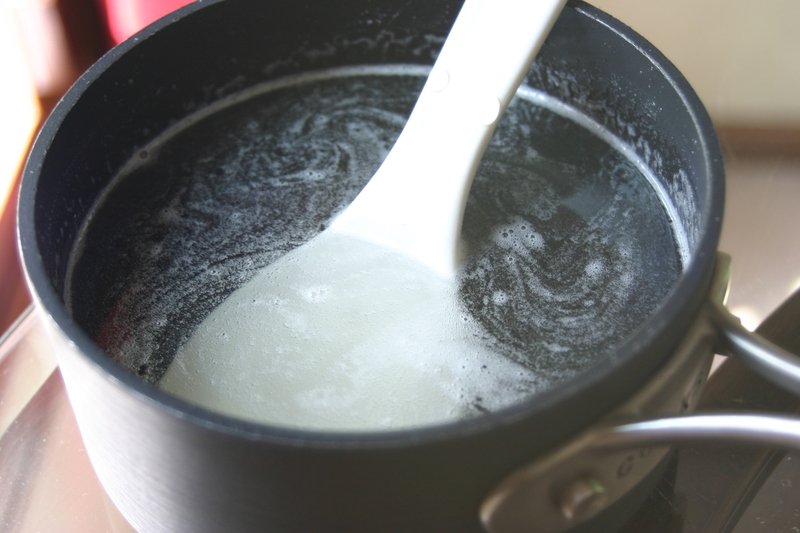 I combined the sugar and water in a sauce pan and stirred constantly for 10 minutes. Next I incorporated lemon juice and orange blossom water and set the sharbat aside to cool while the baklawa finished baking. Once the baklawa was done, I removed it from the oven and spooned the sharbat over the dish evenly. It made some nice bubbles and pops which I wish Mr. N could have seen if he wasn’t at school. He would have loved that action! After the baklawa cooled, I recut the original slices and it was ready to serve. Mr. N said he didn’t really like it, but then he asked for more. It either grew on him or he was hungry. Miss A enjoyed her first serving, but the true test will be if she comes back for more tomorrow. I definitely enjoyed it. The buttery cinnamon flavor is outstanding with the subtle hints of orange blossom. Dad was at work this evening, so his slice is waiting for him. The ice wine will have to wait for another night. I was very pleased with the results of this recipe even though I don’t have anything with which to compare it. I have to say though, I’m darn proud I pulled it off. This was an intimidating recipe and one that had all the makings of a disaster given my typical lack of patience. I think I now have to revisit Greece and try a traditional Greek Baklava as well. Seafood Pasta with Cloves? You Bet! Wow, you did a great job with this…it looks perfect! 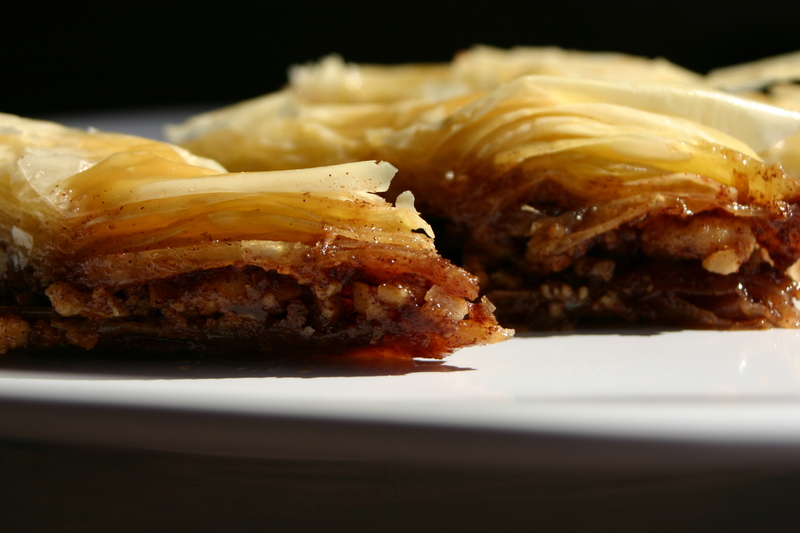 Wait till you see the Macedonian version of baklava – you will love it!! ;-)) It’s with poppy seeds and simple syrup… yum! I’ve never heard of Baklawa, so glad to learn about something new and different! I have always loves the taste and texture of baklava and this looks just as amazing! Hi Linda! It definitely has the texture of baklava, but the taste is far sweeter than the baklava I ate (although that was a while ago, so it could be faulty memory). 😉 Have a great day today! Thank you Christy! It was very good. My hubby has had a chance to have some now and he was really impressed with it too. I think it’s one we’ll keep in our dessert rotation. Thanks for stopping by and commenting! Have a great day. I agree, everybody’s mother or grandmother seems to have her own version of baklava. Of course, my favourite non-dessert use for phyllo is spanakopita or spinach and cheese pie. 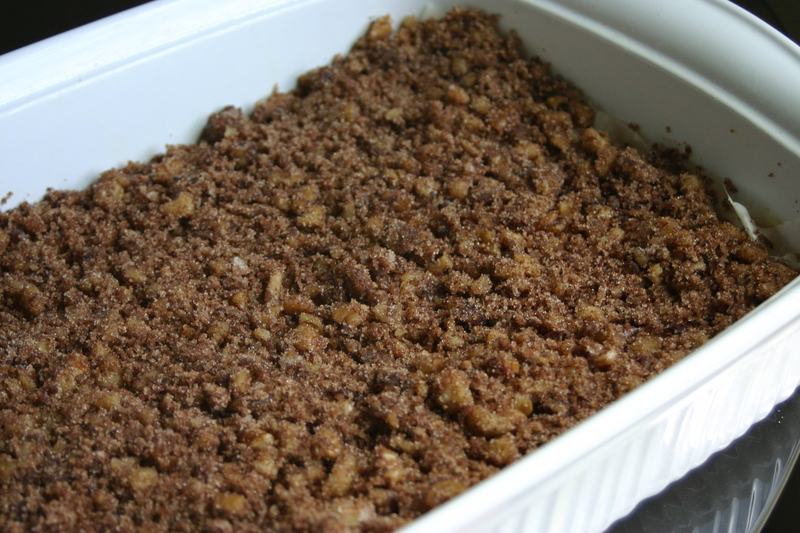 My mother’s version (from the former Yugoslavia) used ground walnuts and a sugar syrup . A combination of the two or perhaps, as she came from a modest household, exotic items like orange blossom extract, were not in their budget. They had access to honey though so I’m surprised she didn’t use it. There are a lot of middle eastern bakeries in my neighbourhood and they use chopped pistachios as the nut inside. I think they use sugar instead of honey in the syrup. I wonder if the squeeze of lemon in the syrup helps to keep it from re-crystallizing upon standing. I’ve also seen bread crumbs added to the ground or finely chopped nut mixture … either to bulk out expensive nuts or to help keep the mixture from drying out. By the way, there’s another wonderful middle eastern/Greek dessert using phyllo pastry and a filling made of cooked semolina. Oooh! Thank you! That last dessert with the semolina looks and sounds delicious! I’m so surprised by the number of baklava recipes out there – seems it’s as varied as banana bread! One thing is for sure, I need to go buy some more phyllo. LOL. You should’ve have seen me reading this.. I’m thinking at first “Does she mean Baklava instead of Baklawa?” lol. I had no idea the Greeks had a version named Baklawa and I have to say this sounds really delicious especially with the almonds added. I might have to try this soon.. gotta find the ingredients first :). I think the almonds will be good and want to try that next time; although I do like the simplicity of the one nut mixture in this one. I would guess you could find the ingredients. If you can find a Middle Eastern grocer or even a grocery store with more ethnic options they’ll likely have them available. 🙂 Have a good one! Omg, this looks wonderful. My mother-in-law always makes baklava but uses honey lot’s and lot’s of honey in her recipe. I actually have some phyllo dough sitting out! Maybe I should make this and have it be my cheat meal for the week! Thanks for sharing this version of baklava. I’m so craving this now! Have a great day Kristy! It’s a serious cheat meal I think. 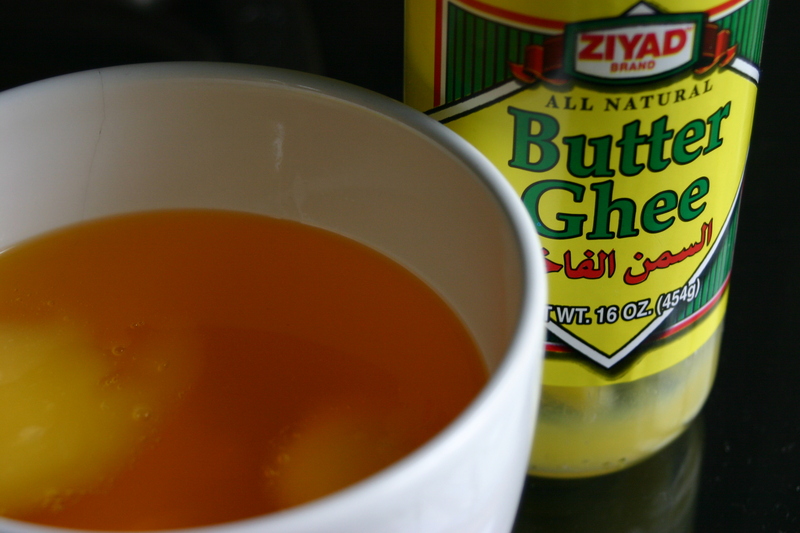 At least with the ghee it feels like it’s completely sinful. Sooooo good though. 😉 Have a good one Lisa! Oh wow that looks wonderful. That picture of little hands is too cute too! Thanks Greg! Have a good one! Mmm, I’m so jealous! I love middle-Eastern sweets and cakes! I just discovered a place (finally) which sells phyllo (or filo as it’s called in other places) pastry so now there’s no excuse not to make them myself. I also found a small Tunisian bakery in Paris which does the most incredible selection of small cakes and bread – think about 100+ different types of cake/sweet all made on-site. They can be super sweet though, so not something I could eat every day 🙂 I must say yours looks fantastic, nice job! Thanks Charles! It really is very tasty – I have to give some of it away today or I’ll eat way too much of it. 😉 I can’t even begin to imagine the trouble I’d be in if I lived in Paris – sweets, breads, cheeses, escargot! I think I’d be in a permanent food coma. Hehe, I have to say, after living here for around 8 years now, I’m kind of tired of the very rich cakes, like the “Opéra” cake, or another type I bought once which, no kidding, was a crispy chocolate base, layers of chocolate mousse, a ganache, chocolate cake, chocolate sauce, praline, more cake and sauce, all topped off with a smooth, mirror-like dome of chocolate with a chocolate shaving on top. It was about the same size as a credit card but I had to eat it in 4 portions, it was so rich – nowadays I really crave simpler things – basic cakes, some whipped cream and fruit is where it’s at! We may take you up on that some day! Paris is a city that all of us really want to visit. I think we’ll wait until the kids are a bit older though. The thought of Miss A on a cross-Atlantic flight right now….eeks! Thanks Eftychia! I’m going to check this recipe out and give it a try. I wonder how different it will taste from the baklawa. I have had baklava before (not in Greece sadly) but after reading your post, think I would definitely enjoy baklawa much more. Thanks Dawn! And thank you for such great inspiration!